Peter Parker is a huge dork, so it’s probably not surprising that when he’s not busy being your friendly neighborhood Spider-Man, he’s as swept up in Blizzard’s excellent hero shooter Overwatch as the rest of the internet. But let’s ask the real questions: who does Spider-Man play as the most in Overwatch? This week’s Spider-Man/Deadpool #10, by Joe Kelley, Ed McGuinness, and Jason Kieth, opens with the heroes recuperating in Deadpool’s clubhouse after a close encounter with a strange new villain trying to turn Wade and Peter into a pile of mush. 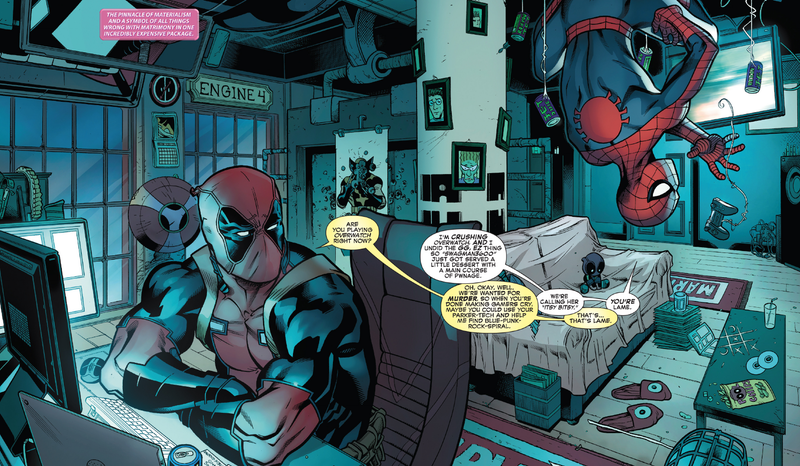 But instead of Deadpool goofing off mid-brainstorm, it’s Peter Parker... by thoroughly thumping some fools in a round or two of Overwatch, apparently. Deadpool probably just wants to save himself for whenever Half-Life 3 comes out. But while we learn the spectacular Spider-Man is a big fan of Blizzard’s latest game, we don’t get to see who he’s playing as. Do you think Spidey’s a mean Genji? Maybe he prefers a supportive character like Mercy, or a tank like Reinhardt? I’m gonna guess Tracer, considering Pete’s love of a good quip himself. Let’s get to the bottom of this clearly crucial moment in comics canon, people. Suggest your theories in the comments below.